Gardens are where children’s imaginations engage nature, and the result is joyful learning. In their new book, Sara Starbuck, Marla Olthof, and Karen Midden detail the rich learning opportunities found in gardening with children, and they provide lots of ideas and inspiration to help you bring a variety of gardening experiences to your program. Dig into this month’s Q&A to learn about the book and the authors, to read about their gardening experiences and memories, and to get some great tips if you’re ready to plant your own garden. What planted the seed that inspired you to team up and write Hollyhocks and Honeybees? Why was it important to you all to update the book as Gardening with Young Children? We had been working together for several years on our garden at Southern Illinois University Carbondale (SIUC). I was the director of the Child Development Laboratories (CDL), Marla was the preschool teacher, and Karen was a parent of two of our children and a faculty member teaching plant and soil science at the university. We started the garden when one of Karen’s graduate students wanted to do her master’s thesis on a children’s garden. We didn’t have any money, so the garden grew from the combined efforts of members of the program, our families, the community, and the university. 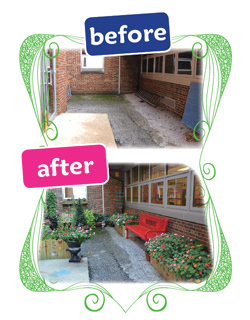 Over the next few years, the garden became the core of our curriculum from spring into fall. During that time, we had been frustrated when we tried to find books on gardening with children this age. Most of them seemed to be a compilation of activities that were based on having certain plants and a lot of them were crafty rather than having authentic material about gardening. I saw the need for a book, so I asked Marla and Karen if they were interested in writing one together, and they agreed. It was pretty much a dream that I sent off the proposal to Redleaf Press, which was my favorite publishing company, and it was accepted. The first book, Hollyhocks and Honeybees, was about our experiences working together. One reason I wanted to update the book is that a lot of my work lately has revolved around children and their lack of exposure to the outdoors and to nature. This is an international trend and children are suffering from both physical and mental health problems as a result. I wanted the book to reflect these concerns. I also wanted to expand the book to cover a broader geographical range and a wider variety of programs. We really wrote mostly about ourselves the first time around. We hoped to include more programs for the second edition. I also wanted to include infants and toddlers because they are children who seem to be most likely to be left inside and they are often overlooked in curriculum books. Since our first book, the efforts and ability to expand urban agriculture and employ sustainable landscape practices have exploded. There are very creative teachers in urban and/or confined areas taking advantage of relatively new practices, such as vertical gardening and gardening on green roofs or simply planting in old gutters attached to a playground fence. We were inspired by many teachers who had the mindset that there are no excuses for not gardening with children, and we wanted to share those inspirations with others. Can you each share a brief timeline of your professional lives? Which areas of expertise did you bring to the book? I got both my bachelor’s and master’s degrees in early childhood education from SIUC. I spent my early years teaching, mostly preschool-age children, although I was teacher-director of an infant-toddler program for a couple years. In 1985, I started at SIUC as the master preschool teacher at the Child Development Laboratories. In 1987, I also began teaching university students as part of my job there. I became director of the CDL in 1992 and stayed in that position until 2002, when I went to work for the Illinois Network of Child Care Resource and Referral Agencies as the higher education administrator. During this time, I also worked on and received my EdD from Nova Southeastern University in child and youth studies. In 2006, I began teaching child development at Southeast Missouri State University and working with the laboratory schools here. As a teacher, I always loved bringing nature into the classroom and taking the children out into nature. I always had lots of animals in my classroom. At CDL, we had an open-door policy so that the children could go inside or outside at their own choosing throughout the day. We had teachers inside and outside and direct access to the playground, so the children could go in or out and the teachers kept count of who was where. Often, I would set up breakfast or snack outside so the children wouldn’t have to come in if they were busy outside. We did a lot of nature activities, like a yearly campout with the families and we even took the preschoolers on a cave expedition once. I wasn’t so much a gardener as a nature person, although I did grow roses at home. So when we started the garden, I brought to it this love of nature. I earned both my bachelor’s and master’s degrees in early childhood education at SIUC. During this time, I worked at the Child Development Laboratories as a student worker and graduate assistant. When I finished my master’s degree in 1993, I became the master preschool teacher at CDL, which was my dream job all through school. Sara’s love of nature rubbed off on me, I guess. I taught at CDL for five years, before marrying my husband, Todd, and moving to northwest Indiana in 1998. At that time, I began work as an early childhood education coordinator at the Purdue University-Calumet Geminus Head Start Resource Center (that always was a mouthful). In this position, I observed, evaluated, and trained teachers in multiple Head Start classrooms across Lake and Porter counties. In the year 2000, we began to write the book and I decided to become a stay-at-home mom. Now I have two girls in elementary school and one in junior high. My contributions to this book were mostly from the teacher’s perspective, but lately I am seeing things more and more from the parent’s point of view. I have two master degrees, one in plant and soil science from Southern Illinois University and the other in landscape architecture (the terminal degree) from the University of Georgia. My thesis subject at SIU was propagating native azaleas from seeds I collected. My MLA thesis was the design of a gaming/simulation to teach children environment issues. I also love designing outdoor spaces. My first professional job, in 1983, was with Edward D. Stone, Jr., and Associates in Fort Lauderdale, FL, designing resorts. It was an awesome job but my passion was teaching and fostering young people to understand and respect natural systems and to see themselves and their lifestyle as part of the big picture. As a faculty teaching landscape design at SIU since 1985, I’ve been lucky to have a profession that pulls my interests together and is so much fun. I have kept up with changing practices in the landscape, such as green roofs, and created demonstration sites on SIU campus. My contributions to this book drew from my past experiences and education in plant and soil science as well as landscape architecture. Gardening with Young Children includes more than 60 hands-on learning activities for children to explore plants and garden creatures. Can you tell us a bit about developing these ideas? Do any of you have personal favorites or great stories related to the activities? The activities came from our own experiences. We actually did them with the children. Some of them came from the children themselves. 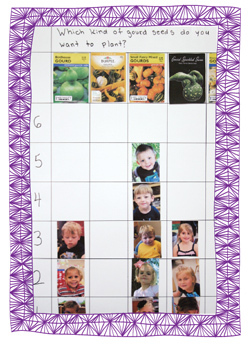 My favorites are the worm activities—like this one. I would never have a classroom without worms. I really don’t remember when I first introduced worms to my preschoolers, but I can tell you that they are perfect pets. The activities are great, but many days, when I worked with the children, I would just put old cafeteria trays out with damp paper towels on them and the worms on the towels. The children would sit for the longest time, 30-45 minutes, holding and studying the worms. We kept the worms in a big plastic tub and would feed the worms leftover fruits and vegetables so the children would see how the worms eat the food and turn it into castings. Sometimes seeds from the plants will sprout in the compost bin. And when the baby worms hatch, they are so tiny you can barely see them. The children are in awe of the babies and very careful with them. My favorite is Dig a Little Deeper. I would call this a “multi-opportunity” activity related to plant growth, the value of soil, and the relationship between the two. Soil is a precious resource (as are plants). Working with the children to carefully dig into the soil becomes an adventure as they discover that it is supporting life. When my graduate student, Jessica, evaluated children in the garden for her thesis, she asked the children to draw a picture of a plant before any gardening experiences and then at the end of a gardening season. None of the students drew roots on the plants in the pre-garden picture but several did on the post-gardening picture. They were also able to explain the purpose of the soil and plant roots (four- and five-year-olds). What else is new in Gardening with Young Children? 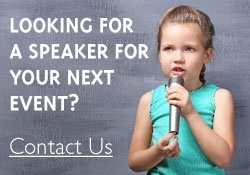 We are really excited about all the contributions from educators in a variety of programs. I was especially pleased that we have stories about infants, toddlers and primary-age children. I think this book is more responsive to teachers who have a shorter school year or who have a less-ideal setting. As Marla said, we got a lot of help on this book and are so grateful to those who were willing to share their work with us. If we could have included all of the stories we heard, places we visited, and photographs we obtained, our book would have been about 500 pages! There are a lot of creative, ambitious teachers getting children engaged in gardening. Hopefully our book will be a stepping-stone for even more teachers. How do gardening activities support children’s learning? 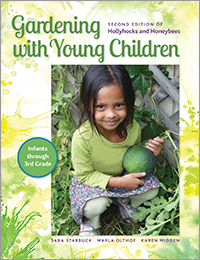 How does your book help early childhood professionals in their gardening endeavors? 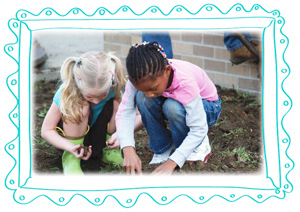 Providing the opportunity for children to garden is like planting a seed. Gardening nourishes a child’s creativity, interest in the natural world, interest in science, relationship of natural systems to humans, a sense of adventure, patience, connection to the source of their food and fiber, an appreciation of beauty, and so much more. Gardening involves all senses as well as physical and mental exercise. Letting a child work, play, and escape to a garden builds their knowledge base by experiences and develops their motor skills by being active. From a “selfish” perspective, I hope to build a love for horticulture and landscape planning, as there is a critical decline in enrollment nationally in these critically valuable professions. We organized our book to allow childhood professionals to take from it what they need. (The introduction is a great overview.) We have chapters that provide philosophy of why garden, we offer step by step on how to garden, we visited numerous gardens and share stories to inspire ideas, we included sample garden designs and “tested” favorite activities ranging from worms and compost to smashing flower petals to make a kaleidoscope. I think our book will be helpful regardless of a professional’s past experience or size/type of space to work with. Gardening can be on the smallest scale and still reap great rewards. 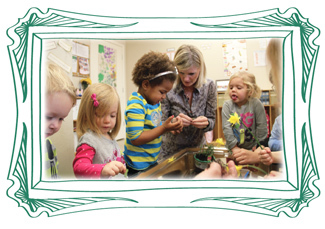 Do you have any tips for early childhood professionals as they plan and maintain a garden for their program? What is the most important thing for caregivers and educators to remember when implementing a gardening curriculum? The most important thing to remember is that you do not have to be a garden expert. You can learn alongside the children. You can look stuff up on the internet or call your local nursery for advice. Growing things is fun and rewarding for kids and adults. A successful garden—or even a potted plant—must have a good healthy soil (or potting mix). If you are planting in ground, take time to improve the soil before planting. Also, make sure someone can water the plants as needed, especially after first planting. Don’t start too big (I’ll say this again in the next question!!). What advice do you have for someone who may doubt his or her gardening skills? Can Gardening with Young Children be used even if an early childhood program doesn’t have the perfect plot of land? You really don’t need to know much. You just have to be willing to try. Whatever happens, it is a learning experience, not a failure. If it doesn’t work out, you can always try again. Also, be willing to ask for help. There are so many people who really love to garden and they love to help other people. Start small with a few containers or a small raised bed. You can always add on. Learn and explore with the children (I still do that with my college students). What you don’t know can become an adventure and will help you build your knowledge. It is important to plan so you have a direction but don’t get restricted by a to do list. And I’ll emphasis what Sara said—start small. Did you garden as a child? 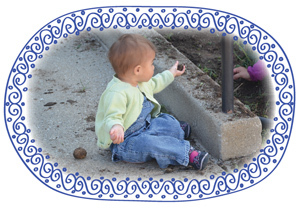 How did those experiences impact what you included in Gardening with Young Children? I didn’t really garden as a child. I remember my mother having a flower garden when I was young, and I remember harvesting four o’clock seeds and making hollyhock dolls. But I was from a big family and my parents were pretty busy raising six kids, so most of what I remember is the informal interaction with plants and animals—making clover chains, blowing dandelion puffs, chasing frogs. I think all those experiences make me want other children to have similar experiences. To me, the garden is just one vehicle for that to happen. My father and grandfather farmed together. We lived a quarter-mile from Gramps and Grandma. We always had a garden and they always had a bigger one. My grandpa could grow anything and my grandma could clean it, snap it, stem it, cut it, cook it, or can it. And, like most farm kids, my sisters and I had to help. I didn’t appreciate the gardening experience at the time as much as I just loved spending time with them and being a part of all the activity. Even now, my parents—who are 66 and 70 years old—have a huge garden, with the best tasting tomatoes ever grown. My mother was from a large family of farmers in Tennessee, where we spent virtually every vacation and most of the summer helping in one way or another. I never tasted store-bought canned food until I was in high school and remember thinking, “no wonder people don’t like vegetables.” My parents’ free time was spent working in the yard. It wasn’t the stiff manicured yard, but a big flowering garden in the spring and summer, colorful leaves in the autumn, and lots of berries for birds in the winter. I grew up with the outdoor space/gardens being as much of a living space as the indoors. My childhood had a large impact on my excitement to be involved in this book. Every child should have the opportunity to find solitude, explore, create adventures, study, play, and be free in a garden as I was so fortunate to do. Tell us about your own garden. What do you look forward to planting each year? April 15 is our frost-free date in southern Illinois and I count the days each year waiting for the nurseries to get the seedlings in. Often, I get several flats of pansies to plant early, and once we are frost-free, I start packing in the flowers for the beds and planters. I go to the nursery and get a big wagon and load it down with plants. I always buy more than I should, but I like to pack the plants close together. The last few years I’ve been choosing begonias because they seem to hold up to the southern Illinois heat. And I always put moss roses in the far beds that don’t get much water. My husband, Charles, however, is the real gardener. He plants the vegetables and every year he begins in late winter or early spring making expeditions in his truck to haul in new compost and horse manure for his raised beds. I love watching him puttering around in the garden, knowing that my summer will be filled with delicious vegetables. It is such a wonderful feeling to go outside and pick the ingredients for the meal I am about to make. There really aren’t any tomatoes except home-grown tomatoes and nothing is better than tiny new potatoes—speck-taters, Charles calls them. Now I garden with my own three daughters in my suburban backyard. We emptied the sand out of their 7-foot hexagon sandbox (because the children of preschool teachers must have a huge sandbox in early childhood!) and we filled it with organic soil. We grow tomatoes under the counsel of my parents. We also grow lots of herbs, which I learned to appreciate and cook with at the Child Development Lab gardens. And when I started my husband wasn’t sure I could grow anything in the backyard, but in the end he was impressed and enjoyed the fresh salsa and bruschetta as much as anyone! Sure, my cilantro died and my dill got fried in the pot on the sunny back deck. At least I tried. This year I had so much basil, mint, chives, and jalapeño peppers at the end of the season that I cleaned, chopped, and froze them for use all winter. That is when I really started to identify with my mother and grandmothers. We also have huge flower gardens in the front yard, which are now mostly filled with perennials, thanks to my generous father-in-law splitting and sharing his plants with us. When I set out to weed these gardens (not nearly often enough) it usually takes me a couple of hours, but I always have a huge sense of accomplishment when I am finished. Many of the plants in our flower gardens were chosen because I fell in love with them at the Child Development Labs garden. I love to grow fresh herbs, annuals in pots, and maintain very simple loosely landscaped areas. I live on five acres that is mostly wooded so I let nature be the garden. I love watching for perennials and wild flowers beginning early spring throughout the summer. I try to have something new popping up as the intensity of our southern Illinois summer evolves. I am very involved on campus with my college students on our green roof, vertical garden, rain garden, and other landscaped areas on campus. We’re sowing Charentais melon and banana pepper seeds this week in the green house so we can plant seedlings on the green roof later this spring. Learn more and see a full list of titles by Sara Starbuck, Marla Olthof, and Karen Midden.